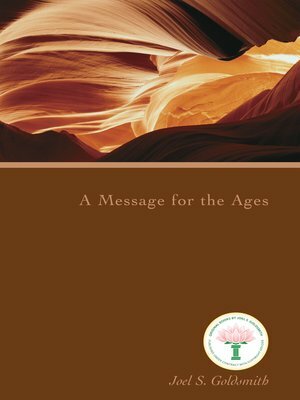 Appropriately titled A Message for the Ages, this book reviews the spiritual principles of the timeless message of The Infinite Way. Goldsmith begins by asking, "What kind of a God do you have?" and then leads the reader to the teaching of the Infinite Way on the nature of God as the very Soul of man. He maintains that until we understand the importance of knowing God aright, there is little use of attempting to learn anything further. To understand the nature of God, Goldsmith says, we must know Omniscience, Omnipotence, and Omnipresence. Without the full understanding of their meaning, we can never approach God, and we need the experience of God to reunite us with our Source so that we may be fulfilled from within of the Spirit. But knowing the nature of God is not enough, says the author. We must also know the nature of error, or so-called "evil," as well as the nature of the illumined consciousness, and the nature of spiritual power. These principles are the Infinite Way "Pearls" revealed in this book. Goldsmith also provides substantial direction for the student who wants to raise his consciousness of these principles above mere intellectual understanding and actively live them. The thought-provoking chapter "Infinite Way Protective Work," is especially helpful in explaining how we can put Infinite Way principles into practice and maintain harmony in our lives. Six of the chapters in A Message for the Ages include a special section on teaching the Infinite Way message, excerpted from the class recordings of Joel Goldsmith. These selections address topics such as the requirements for being a teacher, how to teach the principles, and the relationship between a teacher and a student. Further, in the chapter "Guidelines for Spiritual Unfoldment through the Infinite Way" Goldsmith clearly lays out guidelines for conducting an Infinite Way tape group activity and provides detailed guidance for how to study the Infinite Way message, which truly is a "